A television station entirely devoted to the working needs of teachers in England has been launched. Teachers' TV, costing the government £20m a year but editorially independent, will provide advice and show discussions of educational issues. It is broadcasting 24 hours a day on digital and satellite platforms. Schools Minister Stephen Twigg promised Teachers' TV would be "highly innovative" and make support for staff more accessible. The channel was launched by Adam Hart Davis, the face of BBC science and history programmes such as What the Romans Did for Us. "You decide what you watch and when you watch it," he proclaimed, as camera shots of colourful classrooms flashed across the screen, backed by energetic music. Each 15-minute programme will be shown 18 times over a three-week period. In one, Today presenter John Humphrys tries his hand at teaching English in a secondary school. Judging by the trailer, he gets a tougher time than most politicians provide. One girl tells him: "Do not interrupt us, Mr Humphrys, when we are in the middle of our question." Teachers' TV will be divided into three "zones" - one each for professional advice to primary and secondary staff and another "general" one. This looks at broader topics. For instance, Ofsted boss David Bell is interviewed by educationalist Professor Ted Wragg and Jonathan Dimbleby chairs a debate on proposed reforms to education for 14 to 19-year-olds. Sheena McDonald fronts a weekly news programme and fly-on-the-wall programmes will offer teachers the opportunity to see others at work. A show called Careerwise will advise staff on how to get a "good work-life balance". And Just for Governors will take school governors through ethical dilemmas, such as who is legally responsible when a girl is hit in the face with a pellet from a stolen catapult. 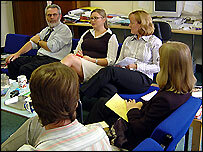 The first programme to be shown on Teachers' TV was Inspirations, a light-hearted look at innovative working methods. In it, Carole Farrar, head of New Earswick Primary School, York, introduced pupils to juggling during a morning assembly. Unfortunately, she was not very good and dropped the balls on the floor. Up stepped Andy Peacock, a supply (temporary) teacher who had been having troubles with one pupil, Ben. Unbeknown to all in the room, Mr Peacock had been juggling for 15 years and was masterful in his control of tricks. Mr Peacock bonded with Ben - teaching him the intricacies of the art - and the school was swept by the craze. This, the teacher said, had become a "brain gym", exercising the left and right sides of the brain and instilling a sense of calm. Ms Farrar said to camera: "If children are interested and motivated to learn and engage, and have the chance and encouragement to follow their own interests, then that has got its own rewards." Ben went on to achieve high grades in his end-of-school exams and the whole teaching staff started learning to promote another craze - the recorder. To re-emphasise the point - which the government is keen to put across - the show's narrator added: "Staffrooms around the country are full of lights being held under a bushel." Teachers' TV is broadcast on digital satellite, NTL, Telewest, HomeChoice, KIT and overnight for recording on Freeview. It also has a dedicated website at www.teachers.tv. That's fantastic. Finally money well spent. It's great support for new and old teachers. I'll be tuning in. I think this is a total waste of money. I think the teachers already have enough training. I am married to a teacher who spends most of her evenings planning, marking and carrying out the numerous other tasks she is expected to do, in her own time, to get the job done. I would love to know when the government, in its infinite wisdom, expects teachers to have the time to watch any of the proposed programmes? Fabulous news. Teachers are one of the most important resources that the country has. Anything that can help them deliver better standards is good news. Personally I think the possibilities are enormous. A+ for imagination. Right, so after a full day in school teaching, followed by an after-school meeting, followed by the obligatory marking of work, followed by the preparation of lessons, I get to sit down and relax. Only now it is expected I spend this time watching Teachers' TV. Be real - this is not going to happen. I, along with all other teachers, need down time. Great! After a day teaching, marking and preparing, I can now go home and watch television programs about... ermm... teaching, marking and preparing. If training time is set aside to use the information broadcast, all well and good. Otherwise it will just add to working hours at a time when the workforce reforms are supposed to be cutting workloads. Weekly work-life balance is crucial here. Not another pointless channel on digital TV. We already have enough of these channels with a viewing audience of a few hundred. What is the point is wasting money like this, it could be better spent elsewhere? I suspect that, like many other satellite channels, it will have a very limited lifespan. As for all of the teachers complaining about having to attend meetings and marking work in the evenings etc - you knew what the job entailed when you took it on. If you don't want to watch this channel, no-one is going to force you. Nice idea, but why not just plug into the many CCTV facilities within our schools so that the nation can watch the ensuing chaos? Maybe then teachers would begin to get the true support that they deserve. Sounds like a thoroughly good idea. Now, how about doing something to improve the other side of the coin - the home element of raising children? You know, discipline, attention, care, curiosity etc. How many persons would profit if given insight into parenting? Surely just £20m per year spent here would have immense benefits to child and community. Before whinging, try watching some of the programmes. My wife has downloaded some from the channel's website and found them really useful. No doubt they will be able watch all day during their long holidays. How about giving us teachers reductions on a subscription to Sky Sports? I'm miles better in the classroom when I've been able to switch off and relax at home. The launch of Teachers' TV coincides with the start of the rugby league season on Sky. I know what I'd rather be watching.